Fill a 1 1/2-quart glass or metal baking dish that will fit inside a 6- or 8-quart Presto® pressure cooker with bread, carefully working the raisins throughout. In a separate mixing bowl, combine evaporated milk, milk, eggs, sugar, cinnamon, and nutmeg. Whisk mixture until frothy. Pour custard mixture over bread. Using a whisk, push down on the bread in a few places to make sure the custard mixes well with the bread. On the foil, rub butter in a circle large enough to cover the top of the baking dish. Cover dish with foil, butter side down, and wrap tightly. Make an aluminum foil lifter* to aid in lifting bowl into and out of the pressure cooker. Add water to pressure cooker. Place baking dish on cooking rack or steamer basket in pressure cooker. Close pressure cooker cover securely. Place pressure regulator on vent pipe. Cook 15 minutes at 15 pounds pressure. Let pressure drop of its own accord. Carefully remove bowl from pressure cooker by lifting with foil handles. Remove foil from bowl, stir and serve warm with Vanilla Rum Sauce. Whip egg yolks and sugar together until light and fluffy; set aside. In a medium sauce pan, heat cream and vanilla until small bubbles form along the sides of the pan; add yolk mixture to the cream. Cook over high heat for 2 minutes, whisking constantly. Remove from heat and strain through a fine strainer, if necessary. Mix in rum. 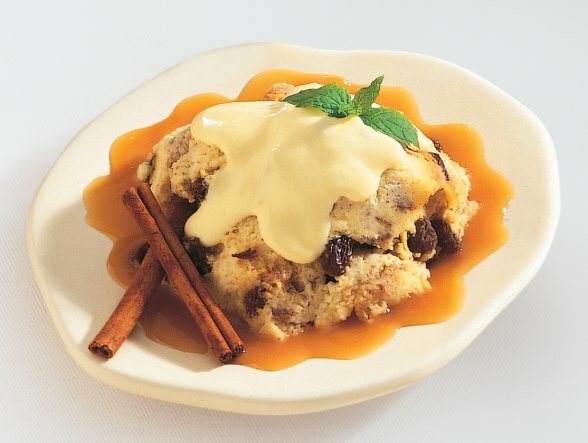 Serve warm or at room temperature over bread pudding. *Pressure Cooking Tip: Use aluminum foil to make a “lifter”. To aid in placing and removing bowls or pans in a pressure cooker, try this easy tip for making a "lifter". Pull out a piece of aluminum foil that will fit all the way around the bowl plus about 8 inches more. It should be long enough to fit under the bottom of the bowl and to provide handles on each side for lifting. Fold the foil lengthwise until it is about 3 inches wide. The "lifter" will enable you to lower the filled bowl into the pressure cooker with ease. Gently fold down the handles during cooking. Lifting out a hot bowl will be a practically effortless.